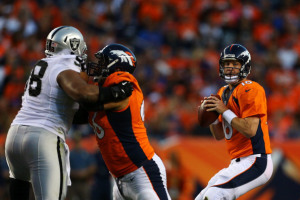 Improving their record to 3-0, the Denver Broncos defeated the Oakland Raiders 37-21 in their 17th Monday Night Football match up. It was Denver’s 14th straight regular-season win, tying the franchise record set in 1998 when the Broncos won their second Super Bowl. This marks the NFL’s longest active streak. Denver came a field goal short of reaching 40 points for the third straight game. The Broncos are leading the league with 127 points so far this season. Peyton Manning was 32 of 37 for 374 yards with three touchdowns. With this, Manning broke the NFL record of 12 touchdown passes through the first three games of the season, which Tom Brady had set in 2011. Manning also broke his own record he set in 2004 with a passer rating above 90 for 15 consecutive regular-season games. His 86.5 completion percentage set a new career high and a Broncos franchise record with a minimum of 20 attempts. Manning has yet to throw an interception, which matches Michael Vick’s record in 2010 – throwing 12 touchdowns before his first interception. If Manning keeps up this pace, he will throw 64 touchdowns this season – breaking Brady’s record 50 touchdowns in 2007. Eric Decker also had a big night finishing with eight catches, one short of a career high, and 133 yards, three short of a career high, and a touchdown. Ronnie Hillman rushed for 66 yards on 9 carries with a touchdown. Wes Welker had seven receptions for 84 yards including a touchdown. Julius Thomas had three receptions for 37 yards including a touchdown. Matt Prater added some more scoring with three field goals. The Raiders quarterback Terrelle Pryor, who was 19 for 28 for 281 yards, connected with Denarius Moore in the middle of the field. Moore ran for 73 yards scoring a touchdown. Coming into the game leading the league with 233 yards, Darren McFadden was only allowed 9 yards on the ground by the Broncos defense. However, McFadden did throw a 16-yard touchdown to Marcel Reece. Can the Denver Broncos keep up this pace and continue to dominate the league?